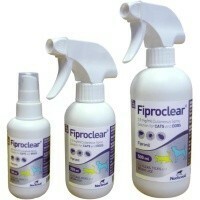 Fiproclear Spray for Cats and Dogs is for the treatment of flea (Ctenocephalides spp.) and tick (Ixodes ricinus, Rhipicephalus sanguineus) infestations in dogs and cats. Fiproclear Spray is also for the treatment of biting lice infestations in dogs (Trichodectes canis) and cats (Felicola subrostratus). The spray has an insecticidal efficacy against new infestations with adult fleas for up to 2 months in cats and up to 3 months in dogs, and a persistent acaricidal efficacy for up to 4 weeks, depending on the level of environmental challenge. Fiproclear Spray can also be used as part of a treatment strategy for the control of Flea Allergy Dermatitis (FAD) in cats, where this has been previously diagnosed by a veterinary surgeon. Please follow the instructions carefully for the correct application and dosage.